I won't bore you with the ugly packaging this thing comes in. 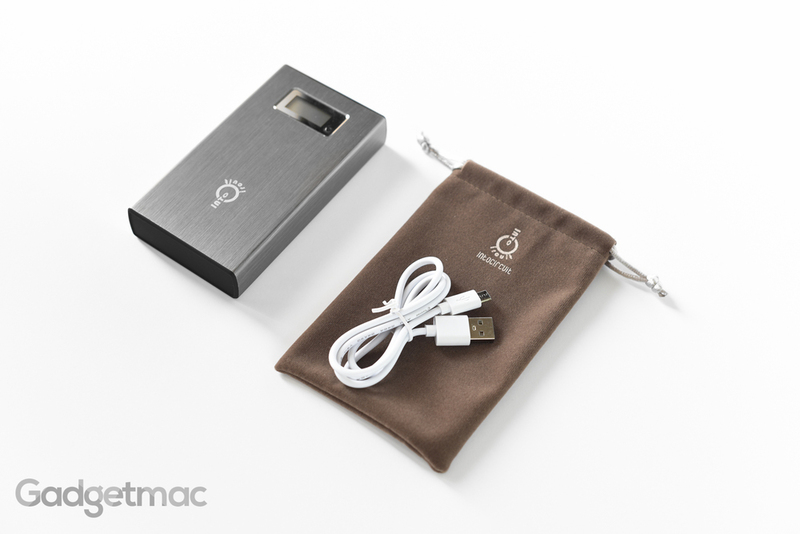 All you need to know is that there's a USB to micro-USB charging cable included, as well as a cheap felt carrying pouch. No other adapters or cable are included so you'll be using the one that came with your device to charge it using the Power Castle battery. On one side of the battery you'll find two USB charging ports, both capable of delivering up to 2.4A/5V of power using Intocircuit's SmartID technology which automatically chooses the required charging current that's most efficient to charge a specific device at its highest charging speed. In between those is the unit's own micro-USB charging input used to charge the 15,000 rechargeable internal battery. And as a neat little bonus, the Power Castle also features a white LED light which can be used as a flashlight. It isn't very bright or as powerful as the LED light on most smartphones, but it's better than no flashlight at all. I don’t know if you’ve ever tired charging a 15,000mAh backup battery, but what I can tell you is that it definitely takes up a lot of time. You’re looking at a whopping 10 hours to fully charge this bad boy up. And since it’s such a huge battery capacity, this really isn’t too much of an inconvenience. Just make sure you charge this thing a day ahead of when you’re planning on going out. The Intocircuit uses its micro-USB port to charge its internal battery at a rate of 2A/5V, which most standard USB ports on a laptop can easily provide. On top, the 2nd Gen Power Castle features a blue backlit digital display showing the charging/discharging status including the remaining battery life in great detail on a 0-100% scale. A very useful feature we'd love to see every other portable battery have. There's a single button next to the display that can be used to power the unit on and off. Quickly double pressing this button activates/deactivates the LED flashlight. In addition to that power button, the 2nd Gen Power Castle also has a neat feature in that plugging in a USB cable will automatically turn the battery on for you to begin charging your smartphone, tablet, wireless headphones - or any other gadget for that matter. I'm going to be brutally honest with you guys. I'm not a fan of the branding or the design. I've never heard about this company before and suffice it to say that nor have you. The enclosure reminds me of one of those cheap empty hard drive enclosures you can get for a few bucks off of eBay. But that's not to say that this battery is poorly built and made. Because it really isn't. Now it's not impressively put together, nor does it feel premium by any means. 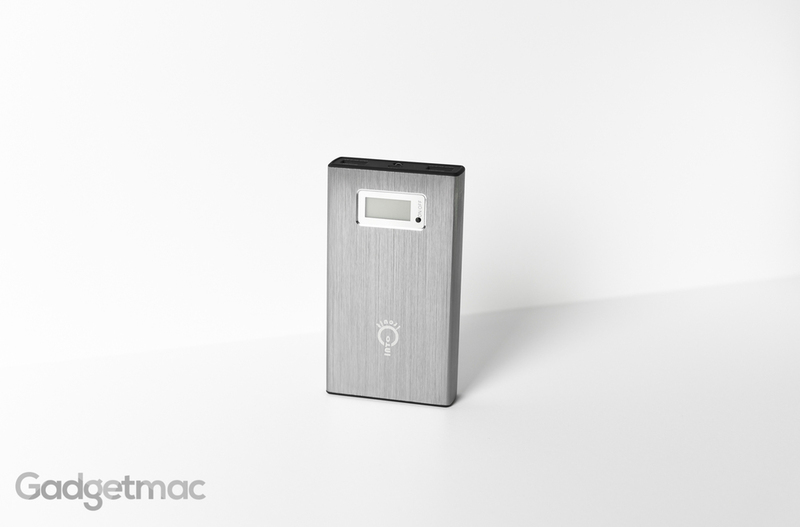 However, this is a decently made portable battery with a brushed aluminum enclosure. The two top and bottom pieces are made out of somewhat thin plastic and I would have loved to see a more sturdier alternative that won't seem like it would crack or pop right out of this battery if you were to drop it on hard ground. This definitely isn't a rugged battery pack you'd want to take with you on a mountain climbing adventure. It'll do just fine in an urbane commute though. So far it has held up really quite well and I haven't particularly cared for it during my time using it out and about and even at home. For the Price you're paying you shouldn't be expecting much more than what is already laid out in front of you. Granted the Power Castle 15,000mAh isn't as beautifully designed or as sleek as other inexpensive portable batteries namely the Vinsic 20,000mAh Power Bank, though it is more compact and easier to carry due to its utilitarian form factor. You could still fit the Power Castle into your pocket if you really wanted to, unless you wear skinny jeans that is. That's how compact it is for its relatively high capacity. And remember, if you want to spend $130 on a Mophie Power Station XL with less capacity then by all means go for the popular, well known name in backup power you most certainly will find selling inside Apple Stores and other big name electronic retailers. This isn't about branding or unique design as much as it is about affordability and raw charging performance. Two qualities that the Power Castle definitely has in it. There are several ways in which you can connect your devices to the external battery to charge, and my favorite piece of gear is this very short and portable Native Union Key Cable I keep with me on my keychain at all times. That way I don’t need to carry a long cable with me, which isn’t convenient to say the least. But of course you can use whatever suits your needs. Let's talk about what actually matters most when it comes to portable power, and that of course is none other than charging performance. The Power Castle's 15,000 mAh battery capacity along with its dual high-powered USB charging output ports deliver a staggering performance of long-lasting backup power and speedy charging capabilities. You can fully charge an iPhone 6 Plus in an hour and a half, or 75% in only an hour. You'll get up to 3 full charges out of the Castle's 15,000mAh and then some before it runs out. An iPad Air 2 can be charged back to 75% in 2.5 hours. I've found that the Power Castle will fully charge an iPad Air 2 with as much as 39% battery remaining, which was enough to recharge two iPhone 6s a little more than halfway to 100%. That's simply outstanding performance. And as soon as your device reaches a full charge, the Power Castle's overcharge protection feature will automatically stop charging your device and will turn itself off. Not that I carry around my magnetic charger with me nor do I plan on charging my smartwatch on the go, but for the sake of this review I decided to go ahead and test if I could also charge my Apple Watch using the new magnetic charging adapter and I found that the Power Castle was more than capable of charging the Apple Watch from zero to 60% in under an hour with only 2% battery drain from the external battery. Needless to say this thing can be used exclusively to fully charge your Apple Watch for weeks before draining completely. Another great thing about the Power Castle's dual USB ports is that it charges two devices at once just as fast as it charges a single device at any given time. This means that these two USB charging ports are indeed rated to provide an equal output of 2.4A of current for super quick charging. In my testing, I plugged in two iPhones to charge from zero and I was pleasantly surprised, astounded even, that they both were quickly being recharged at the same exact pace. It only shows that this battery does indeed have some great intelligent circuitry to handle charging on a very efficient level. Now that we have the ultimate new versatile USB-C connector – which supports bi-directional power transfer, we can charge our ultra-portable laptops the same way we charge our smartphones, tablets and other every-day-carry essentials without having to look for an outlet and be forced to stay in a single place to charge up. Yes that’s right, the new 12-inch Retina MacBook alongside Google’s Chromebook Pixel 2 has the ability to be charged using an external portable battery pack. I'm using this $13 high quality 1-meter long USB-C to standard USB (2.0) cable from Google and it works flawlessly with the Power Castle battery. It will charge you MacBook, but it will do so very slowly. In two hours I was able to charge the MacBook in sleep mode back to 20% with an 80% remaining battery life left on the Power Castle. Not bad, but definitely not an impressive performance worth getting exciting about. 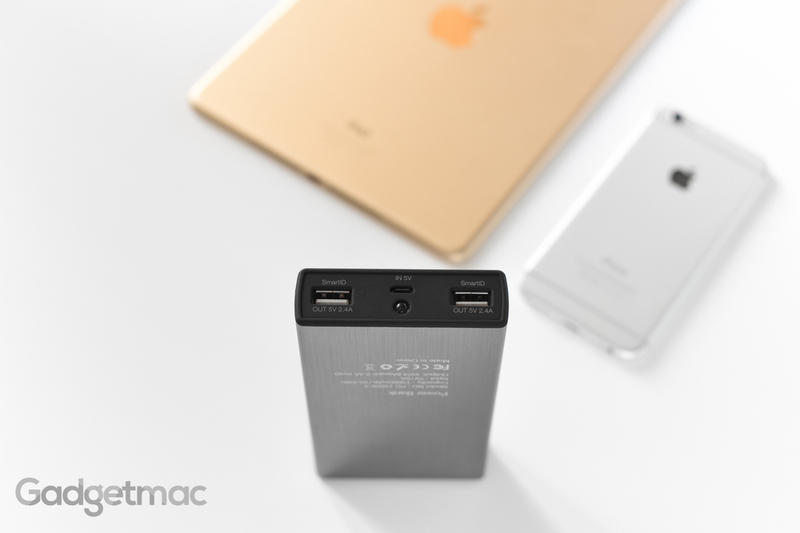 The Power Castle will just about charge a 12-inch MacBook all the way up to 90%. This will allow you to keep on watching movies on a long flight and let you continue working on the move when a power outlet is not within reach. Of course charging such a large battery using this out-of-the-mill portable backup battery designed mostly for smaller gadgets like smartphones and tablets, does take time. More specifically, it takes 11 hours to (nearly) fully charge using this external battery and just 3 hours to fully charge using the supplied wall adapter that comes with the MacBook so this its safe to say that this particular battery isn't quite up to the task of replacing the stock power adapter. 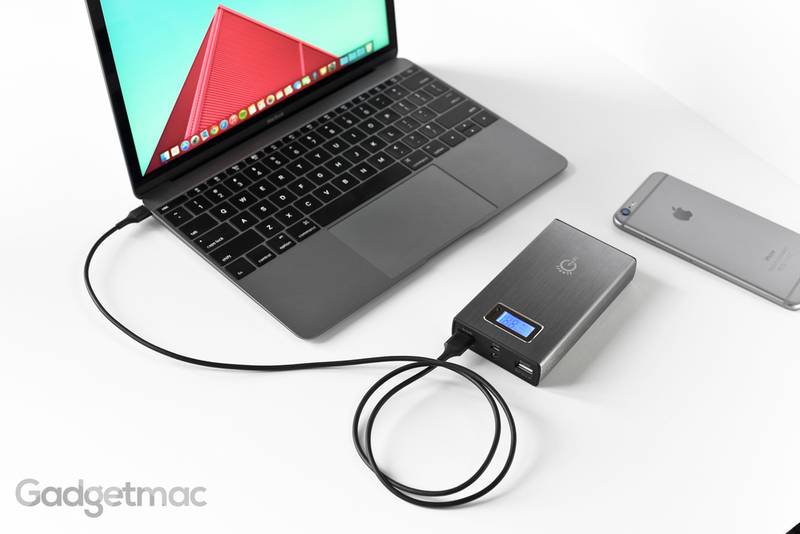 The Intocircuit Power Castle battery is also not powerful enough to deliver the necessary charging current to charge the MacBook's battery when it's being used. In a way it'll keep powering it without it having to use its own juice and that's fine too as long as you're able to use your laptop. So it essentially acts as a live power source instead of putting a charge back into the battery whenever you're actually using your MacBook. 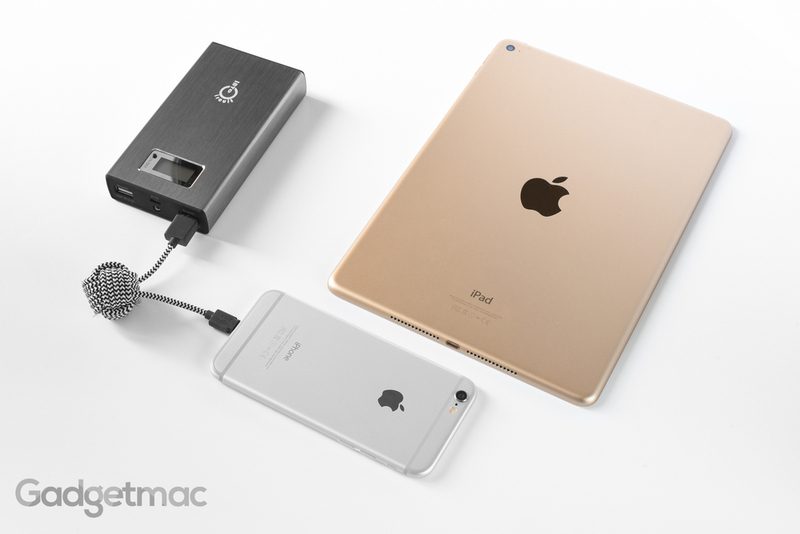 This isn't the best looking portable battery charger we've seen, nor is it impressively made. That being said, this is one amazingly performing portable battery charger with its Tesla-like super charging capability. 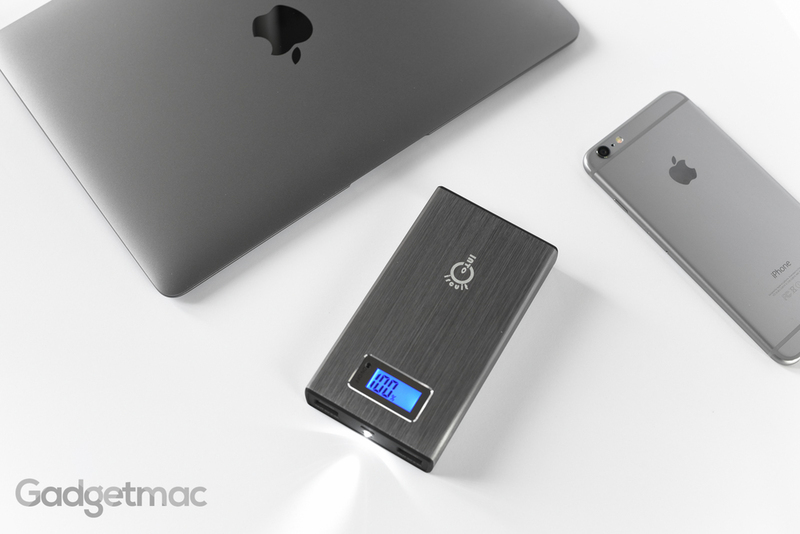 The Intocircuit 2nd Power Castle 15,000mAh has plenty of battery power under its utilitarian brushed aluminum chassis to pretty much charge any one (or two) of your mobile gadgets. We couldn’t be more thrilled with the performance benchmarks we’ve been able to squeeze out of such a relatively small, yet massive battery pack. With its ultra-fast dual-USB charging ports, extremely useful backlit digital battery meter display, somewhat weak yet still useful built-in LED flashlight and affordable price tag, we can highly recommend this backup battery to anyone looking for maximum portable power that’s fast and efficient at charging anything from smartphones to tablets, compact cameras, and even a MacBook – at a relatively low cost. We would have loved to see some type of a integrated charging cable (a choice between Lightning or micro-USB) so that we wouldn't need to carry an extra cable. Alas, that doesn't seem to be an option in these larger capacity batteries yet. That is if you're willing to spend as much as $150 for the 12,000mAh Mophie PowerStation Plus with integrated Lightning Connector cable (or $130 for the micro-USB cable version).